Do you wish you could jet set off to London to take in the latest National Theatre performance? Have you been meaning to scratch seeing Monet’s masterpieces off your bucket list? Is your bank account balance a little too low to justify taking off on such extravagant expeditions? You’re in luck! Cineplex Events brings acclaimed plays and world-famous works of art to a theatre near you with its Stage and In The Gallery Series presentations. Plays starring your favourite actors are broadcast to theatres, and you can be sure you’ll beat the gallery crowds as you study the paintings of renowned artists like Monet, Michelangelo and more from the comfort of your seat. Here’s a selection of just some of what’s coming up next from Cineplex Events. Set in New York City at the turn of the century and based on a true story, Disney’s Newsies is the rousing tale of Jack Kelly, a charismatic newsboy and leader of a ragged band of teenaged newsies, who dreams of a better life far from the hardship of the streets. 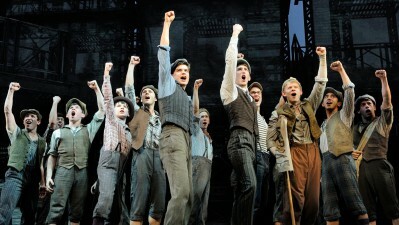 Originally a film starring a young Christian Bale, Newsies became a Tony Award-winning broadway hit starring Supergirl actor Jeremy Jordan. but their relationship is already in trouble. The play stars The Affair actor Ruth Wilson. A ship is wrecked on the rocks. Viola is washed ashore but her twin brother Sebastien is lost. Determined to survive on her own, she steps out to explore a new land. So begins a whirlwind of mistaken identity and unrequited love. Based on the play by William Shakespeare, Twelfth Night will be broadcast live from the National Theatre. Now you can gain new insight into the works of impressionist master Claude Monet – in his own words. Using letters and other private writings, I, Claude Monet reveals in-depth details about the man who not only painted the picture that gave birth to impressionism, but who was perhaps the most influential and successful painter of the 19th and early 20th centuries. Monet’s life is a gripping tale about a man who, behind his sun-dazzled canvases, suffered from feelings of depression, loneliness and even suicide. Then, as his art developed and his love of gardening led to the glories of his garden at Giverney, his humour, insight and love of life is revealed. To see when these presentations are playing at a theatre near you, visit Cineplex.com/Events.